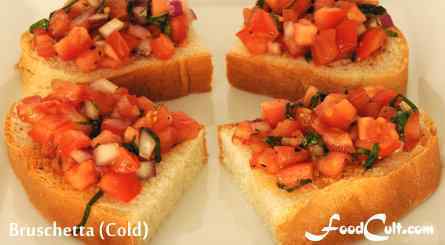 Galganov's Easy Recipe for Delicious Bruschetta! 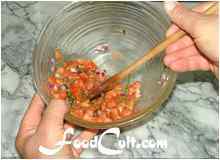 Assemble all topping ingredients (except cheese) in a mixing bowl and stir together (do not crush the tomato while stirring). Let sit at least about 15 minutes to allow the flavours to merge. Taste and adjust as necessary - the taste should be lively and fresh. Be very careful not to allow salt, pepper garlic or onion to over-take the flavour. These should only be barely suggested - they do not have a prominent spot in this dish. Top your bread (or toast) and plate for serving cold. If at all dry - Drizzle a little extra olive oil over the topped bread - allowing the flavours to wash down into the bread. Place on a baking sheet and top with cheese if so desired. Put in a hot oven - preheated to 375oF (190oC) and bake until tomato begins to sweat. Finish for 3 to 5 minutes under the broiler - just to toast the bread (or until the cheese starts to turn golden - if applicable). Different simple breads may work well with this recipe (such as a nice calebrese loaf) - experiment to find your favourite. Use a variety of tomato types for more complex and interesting flavours. 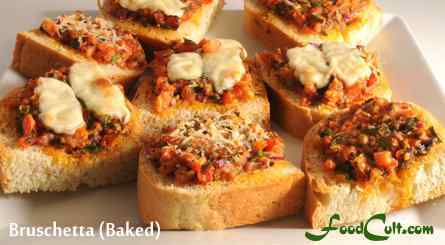 Olive oil drizzled over the topped bread will wash flavours from your toppings into the bread. Assure you cut your bread thick enough. Even with a less watery topping your bread will become soggy if too thin. Overly watery bruschetta topping? Use a slotted spoon. Then drizzle some of the liquid back on for the bread to soak up! Bruschetta, by definition, is on toast, however, it is found in so many ways today that nothing is really the wrong way ... unless you don't like the taste! 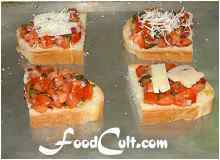 Here are the givens: bruschetta is not bruschetta if it isn't on bread in some form. Bruschetta is not bruschetta if there is no tomato and basil on it (tomato and basil are lovers - they belong together!) ... and, then, is Italian food - Italian food without olive oil and garlic? So, at it's most basic, bruschetta is toasted garlic bread with tomato and basil. Beyond that, it may be served any number of ways - with a bit of cheese on it, or olives or what ever flavours you like best. We choose not to use toasted garlic bread. Rather, we favour a Basic, Italian White Bread. We, then, make a topping and put it on the bread (untoasted). A joy cold, celebrating fresh tomatoes and basil leaves, it is equally wonderful hot. In this case, we will put the entire concoction, on the bread, into the oven to fire. This particular bread is chosen because it has no competing flavours. Every bite is a rich and satisfying mouthful of summer. This simple loaf readily accepts flavours of the topping - adopting them as its own! Sometimes we will even drizzle a little extra olive oil over the topped bread - washing the flavours down into the bread slices. While some may prefer a French Bread we prefer the less salty, less crusty, more absorbent texture of the basic Italian white bread. When served hot, some cheese may also be added. We favour a few strips of caciocavallo but a bit of mozarella with some grated parmigiano reggiano ... or simply a bit of your favourite grated parmesan is very nice too! Now go enjoy your bruschetta adventure!